Express your sincerest sympathy with this boxed bundle set of thank you cards for personal, handwritten notes. Classy designs. Each card design balances simple, modern and contemporary design without coming off as "fancy" with a minimalist and wooden stylish look. Gender neutral. Neither masculine or feminine, our cards are ideal for all, whether it's a thank you to an adult, teenager, child, dad or mom, a guy or a girl, your best friend, or a teacher. Value at a low price. Made from a beautiful and heavy kraft stationary paper in a papyrus style to span all occasions from formal to informal, such as graduations to business in the office. All cards are free of logos and labels for use with coworkers, employees, corporate and career events. Don't forget those other occasions. A handwritten note to express your gratitude for someone's kindness makes all the difference. Whether for a bereavement, engagement party, retirement party, a patriotic or religious event, Hanukkah or a bar mitzvah, these cards make all the difference for those occasions when you want show sincere appreciation. Don't forget those times that you would not normally consider, like a veterinarian who healed has your pet, or a doctor who has shown you or a loved one the utmost care. Large cards The 4 x 6 inch cards are large enough to express your message. All cards are plain with enough space to color and personalize (bring out your artistic side!). Show your hospitality as the host during party season with a big thank you and a personalized or inspirational quote for your guests. The cards you need . Look no further; this value kit is all you need to say "danke" "merci" or "gracias" in 2018. ✔️ GIVE THANKS: Nowadays, a handwritten thank you means so much for those occasions where you need to express your sympathy and gratitude to the people you appreciate. Lovely and elegant, these cards are perfect for expressing thanks for a gift. Ideal for a baby or bridal shower, engagement, baptism, christening, birthday, funeral, boy's and girl's birth, or a thank you to wedding guests (or a groomsmen or bridesmaid), clients, an employee, a nurse, or any special occasion. 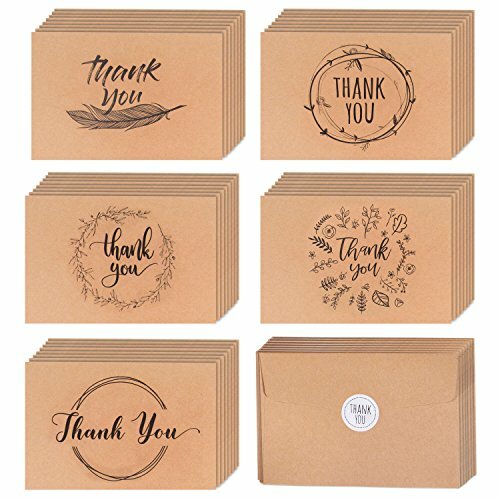 ✔️ RUSTIC STYLE ASSORTMENT: The box set of 40 vintage and elegant kraft notecards contains 5 assorted and unique card designs in packs of 8. Each soft brown card includes a coordinating envelope and sticker to seal it. Be sure to always have a cute card on hand anytime you need to send a thank you or a special note. ✔️ PREMIUM QUALITY AND CHIC DESIGN: Vintage styling meets superior quality; all cards are made from a thick and heavy duty burlap kraft paper at a grade of 300 grams per square meter (thickest available on Amazon). Designed in the USA, each card's design embodies a simple and rustic yet elegant mark of appreciation for family, friends, guests, colleagues, teachers, business clients or that special someone. ✔️ LARGE AND BLANK ON THE INSIDE: Each card's 4" X 6" measurement leaves plenty of space for showing your sincere appreciation to those special people in your life. Each envelope is big enough to fit a standard sized photo. All cards are blank on the inside and come in a durable and reusable box for easy storage. ✔️ ADHESIVE TAPE INCLUDED: We have noticed that, with time, moisture seal envelopes often fail to seal completely and evenly. We chose to use non-adhesive elegant envelopes with accompanying stickers which neatly seal the envelopes. If you prefer additional adhesion, a small discrete double sided adhesive tape is included in our box. Simply peel off the surface layer and apply to each corner of the envelope to completely seal it shut. If you have any questions about this product by VNS Creations, contact us by completing and submitting the form below. If you are looking for a specif part number, please include it with your message.